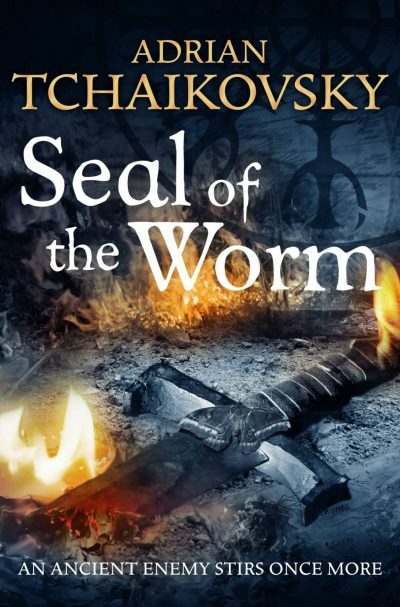 2014’s Seal of the Worm is the tenth and final volume in Adrian Tchaikovsky’s Shadow of the Apt series. Good news for Wasp Empress Seda: its old enemy Collegium has fallen and occupied by Wasp forces. Stenwold Maker has vanished and is presumed dead (at least by some). Seda’s mystic rival Cheerwell Maker has been consigned to the lightless realm of the Worm, which is as close to hell as this world offers. There are just a few minor hitches. The Wasp Empire’s alliance with the Spiderlands proved all too brief. Imperial forces need guard their flank from their former ally. What seemed an unstoppable advance has stalled. More importantly, when Seda tipped Cheerwell and her friends into the Worm’s realm, Seda released something terrible. The Worm was sealed away before recorded history (at least Lowland history). Vast and powerful, its true nature has been forgotten by the Apt. Even locking it in a stygian pocket universe was not enough to kill the abomination. Remnant minions, the Centipede Kinden, have survived there as well. For centuries, it has battered at its prison. It didn’t have enough power to escape. Thanks to Seda, that is no longer true. Now the Worm can create brief doorways into the natural realm. The doorways don’t last long, but they last long enough that it can depopulate entire towns. The seals keeping it out of the world are crumbling. Soon the Worm will be able to return to the natural world in full strength. Once it does, it will consume all. Not to worry! While Cheerwell and her friend gain a personal acquaintance with the horror that is the Worm, Seda is working on a cunning plan, a magical ritual that is sure to seal the Worm away once more. All it will take is a dark ritual that demands the blood of legions of innocents. It’s odd but this world does not seem to have creation myths as such, even though various features strongly suggest that they were designed. Which obviously they were because this is a work of fiction, but I mean from the characters’ perspective. In fact, organized religion in general seems to be absent, aside from the matter of the cult of the Worm. It may be that the Apt don’t have the cognitive tools needed for religious tendencies, while the Inapt are distracted by all the horrifying phenomena they can perceive thanks to being open to magic. Speaking of the Apt/Inapt divide: it was already clear from Cheerwell’s development, from Apt to sorcerer queen, that it’s possible to reset cognitive switches in Kinden brains. This novel reveals that that can be weaponized. Having not read the Tales of the Apt series, I don’t know if cognitive engineering ever caught on once the survivors shared what happened to them. That’s ten books published between 2008’s Empire in Black and Gold and 2014’s Seal of the Worm. An entire series over and done in half the time a certain other author has taken to produce five books. Still, who’s counting? Seda doesn’t explain her strategy to the rest of her government; they might not approve of combining industrial-scale logistics with blood magic. But if she had explained, if the hadn’t killed or exiled her trusted advisors, she might not have left her empire and everything around it vulnerable to an eldritch abomination that was nicely sealed away until Seda got ambitious. Well, her hubris will be punished. Too bad for the rest of the world. This was never a series where characters could rely on plot immunity, with the possible exceptions of Cheerwell and Seda. This volume, however, chews through characters at a ferocious rate. The characters may not know they are in volume ten of a ten part series, but its author certainly did. Camping with Cheerwell is never a good idea, but this is by far the worst camping trip ever. Seal of the Worm is also the volume where various plot seeds planted volumes ago finally sprout. Tchaikovsky turns out not to have been winging it all along. Did this need to be ten volumes? Well, cramming all the plot hooks into, oh, three books might have been doable — if each book had been an unliftable tome like the Malazan books. Breaking the books into convenient sizes was an effective way to avoid mass hernias. Seal of the Worm is available here (Amazon) and here (Chapters-Indigo).